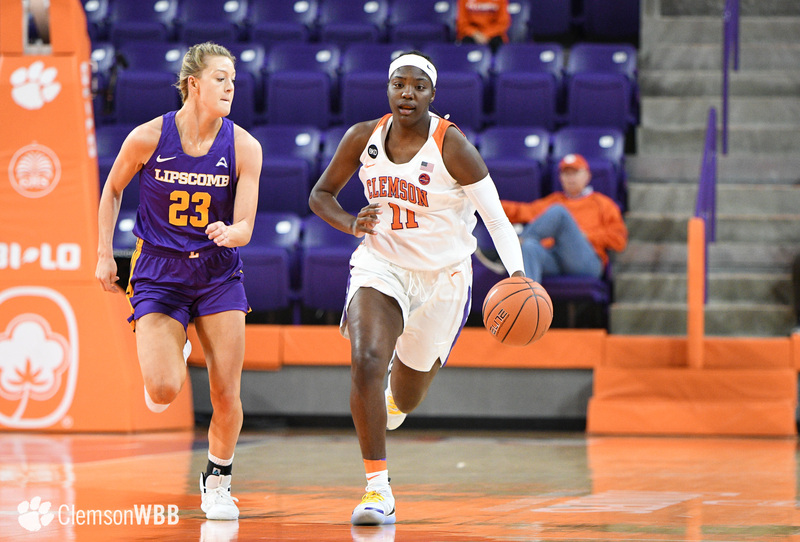 CLEMSON, S.C. — The Clemson Tigers (2-0) continued their winning ways on Sunday, limiting the Lipscomb Bisons (1-1) to just 26 points in a commanding victory for the home team. 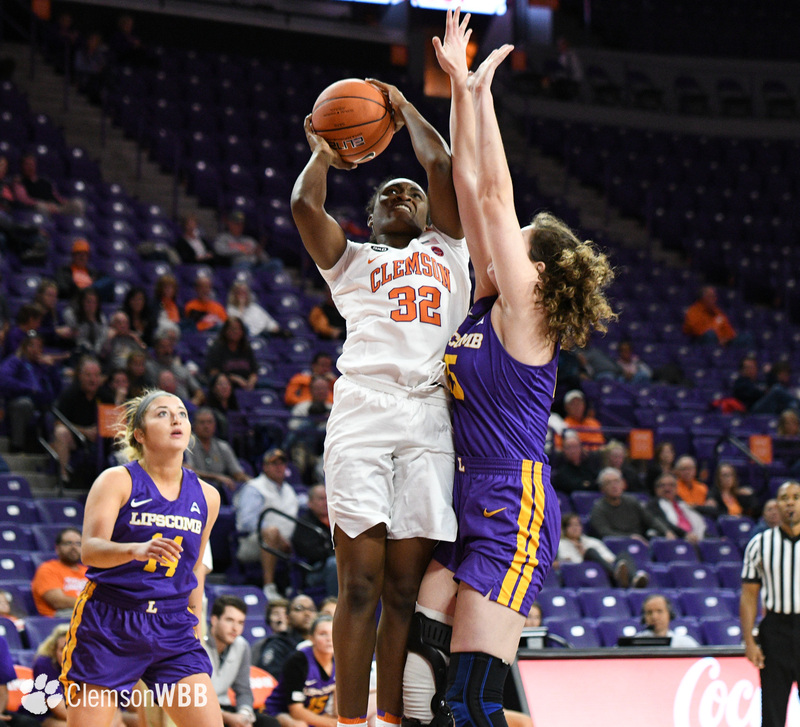 Giving up no more than 10 points in any of the four quarters, Clemson used a stellar defensive showing to coast to a 68-26 triumph. 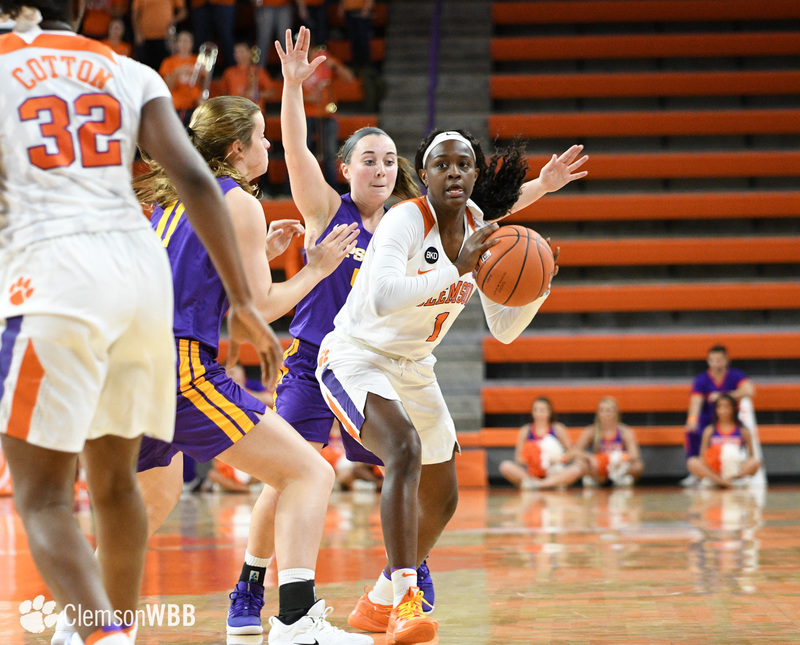 The Tigers played inspired basketball in the backcourt, using an imposing defense to tie the program record for fewest points allowed at 26. 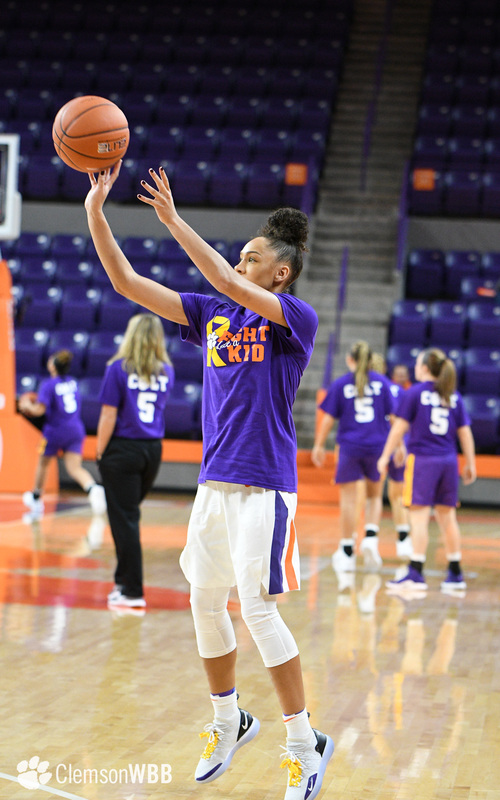 Clemson last held an opponent to 26 points almost 20 years to the day, when it defeated UNC-Asheville 93-26 on Nov. 14, 1998. 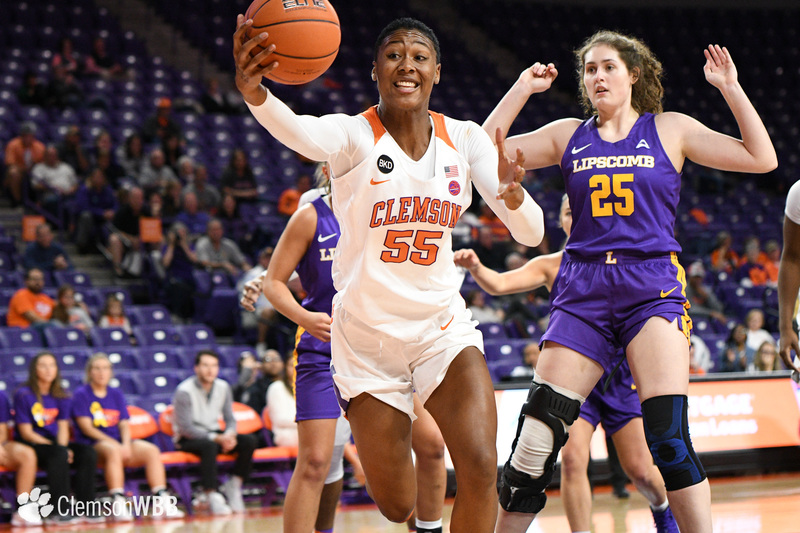 Clemson outrebounded the Bisons by 23 and limited them to 18 percent shooting in the Tigers’ 68-26 win. 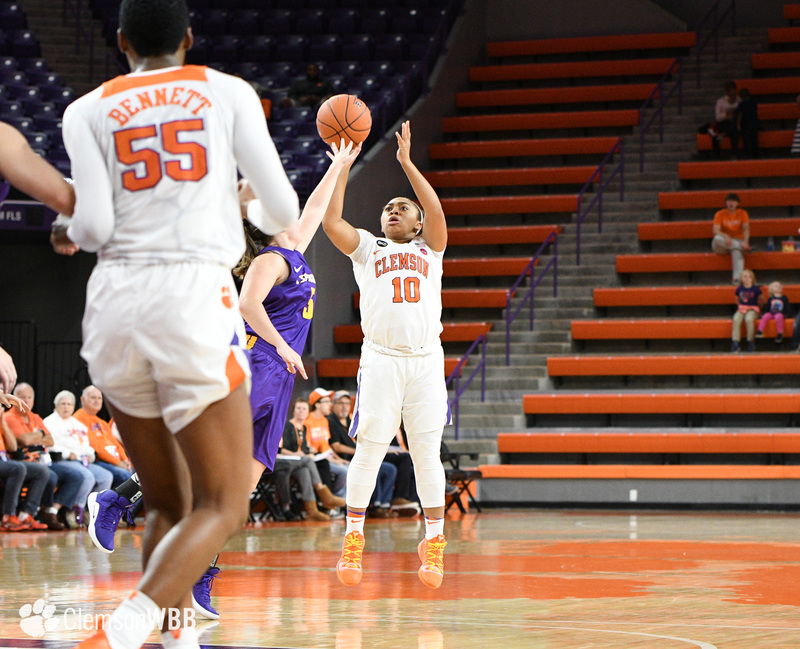 Freshman guard Camreé Clegg experienced a breakout performance, hitting a trio of three-pointers, including a buzzer-beating deep ball to close out the third quarter. 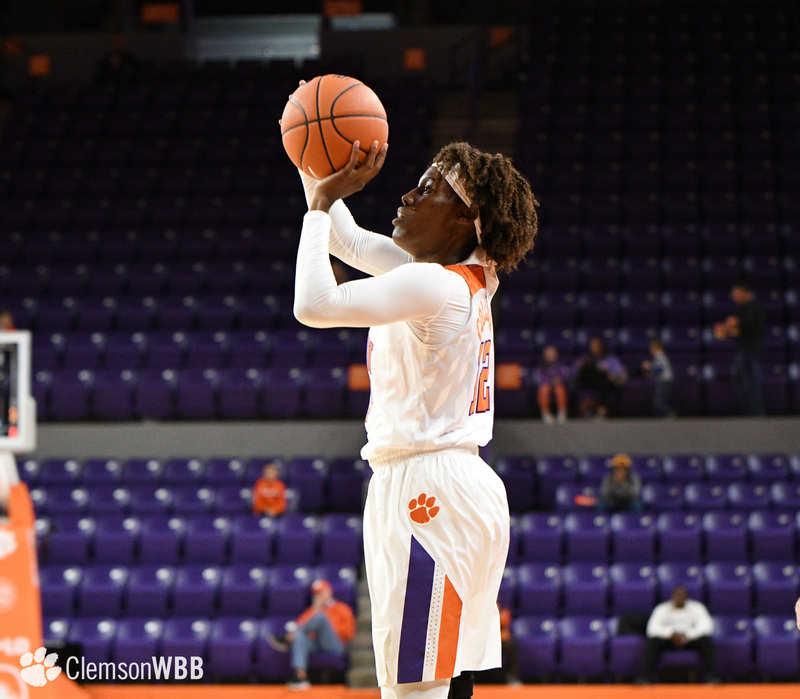 For the second game in a row, Kobi Thorton led the Tigers in scoring, finishing with 18 points. 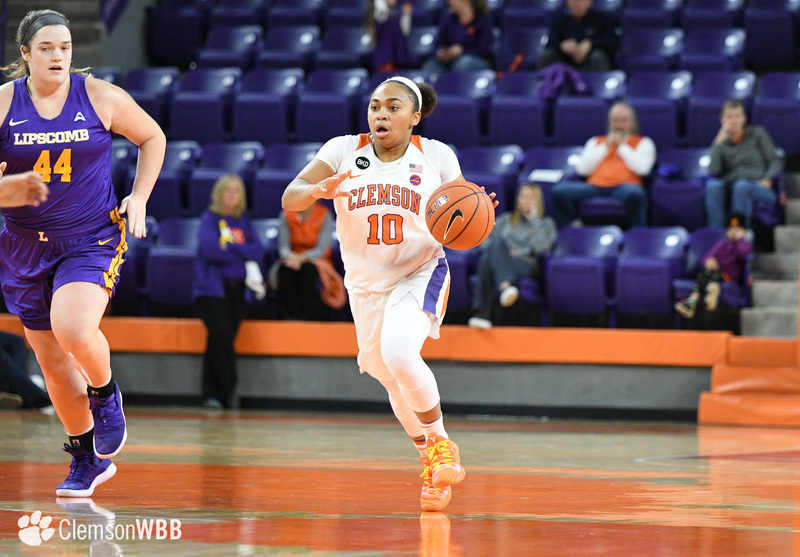 On the glass, center Tylar Bennett led Clemson with a career-high 11 rebounds. 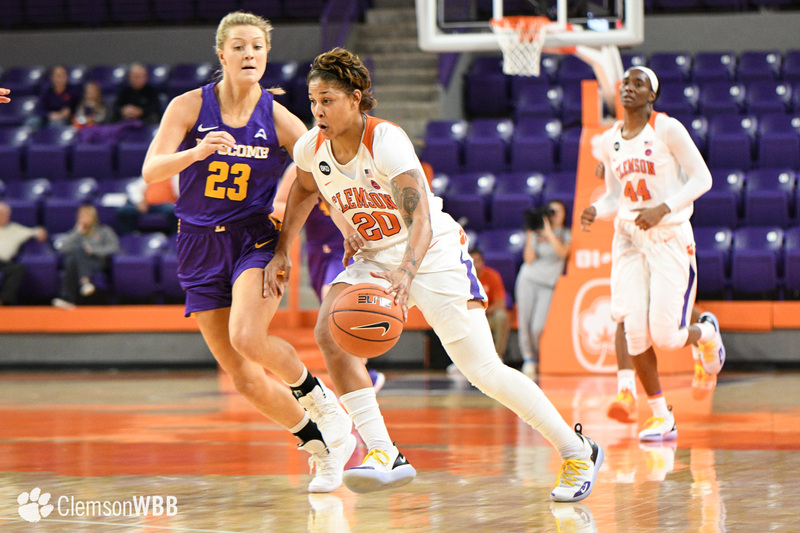 The Bisons took a 2-0 lead at the beginning of the game, which provided them with their only momentum of the afternoon. 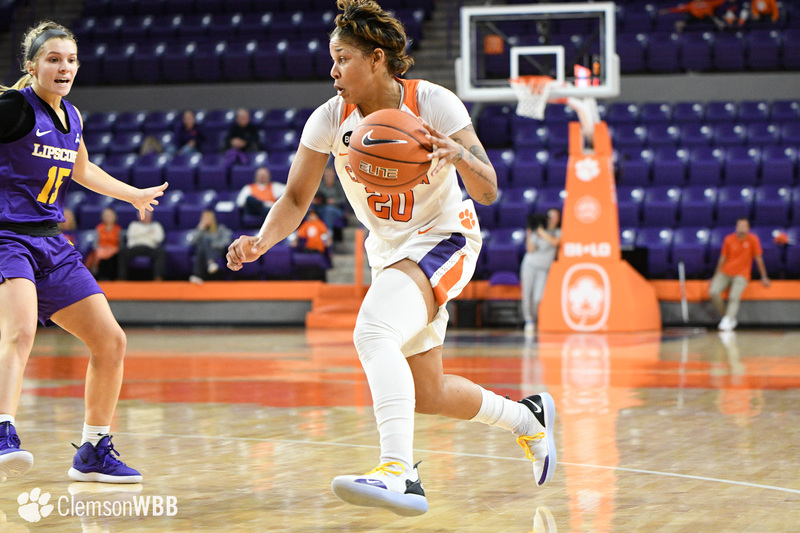 After that, the Tigers went on an 18-0 run over the course of the final 7:39 of the first quarter to take a 20-2 lead into the second quarter. 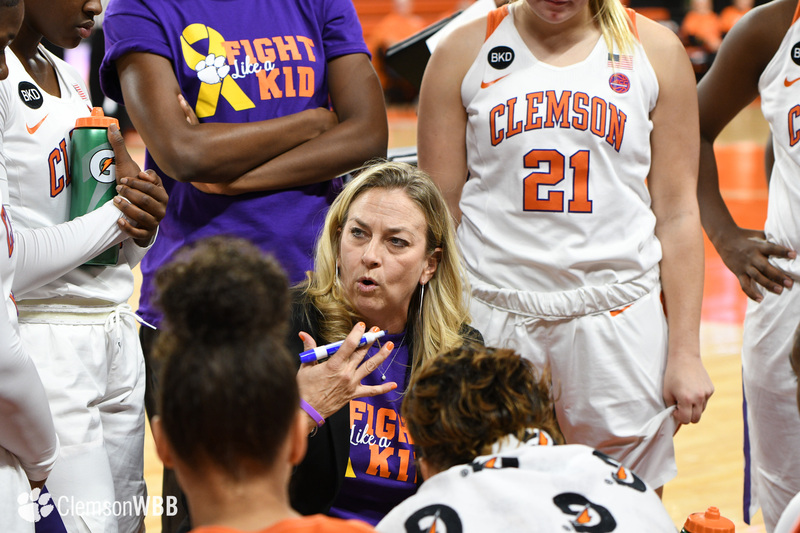 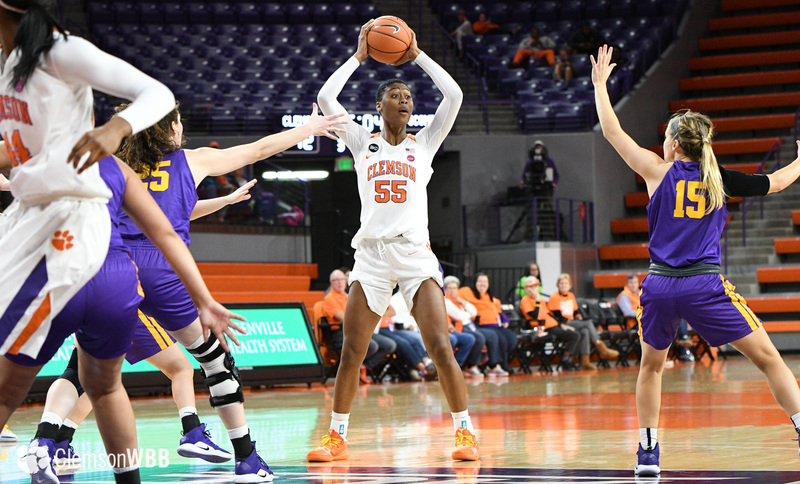 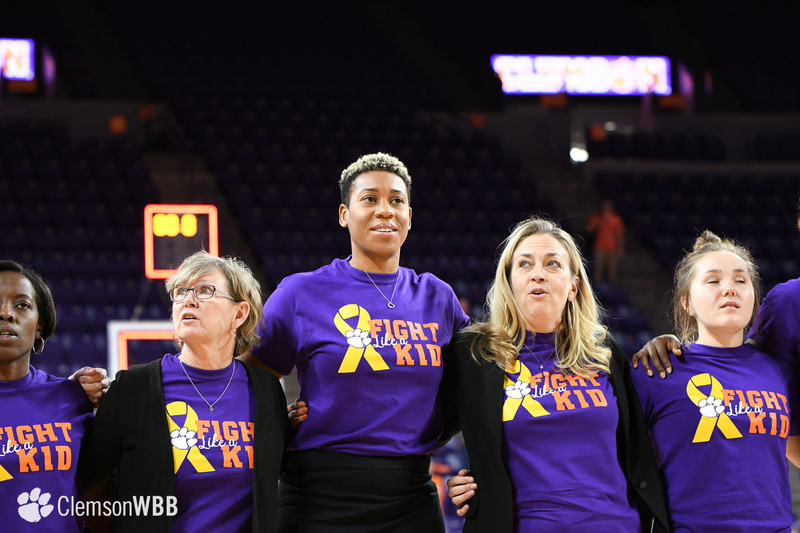 Clemson corralled 20 rebounds in the opening period, including six by guard Aliyah Collier to set the tone for what proved to be an overall dominant performance on the glass by the Tigers. 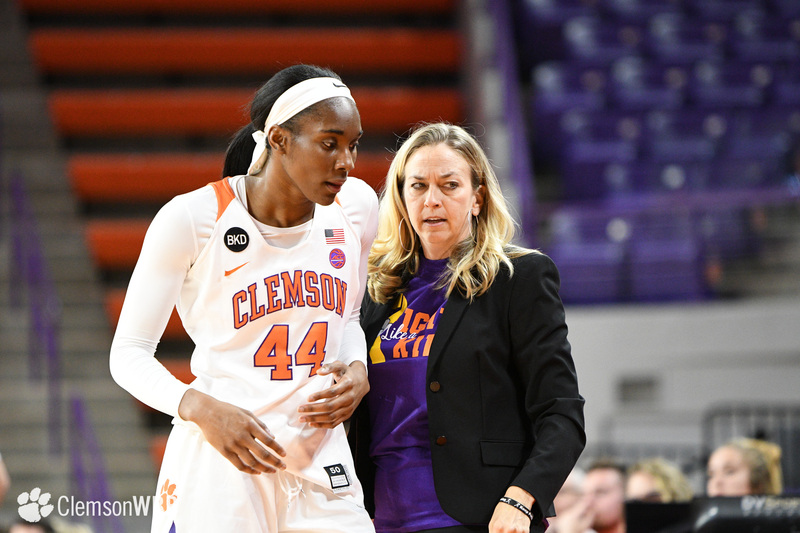 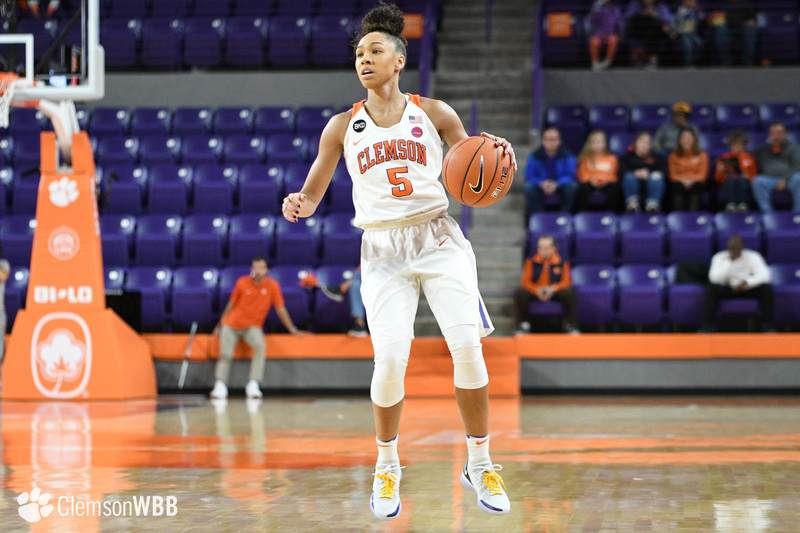 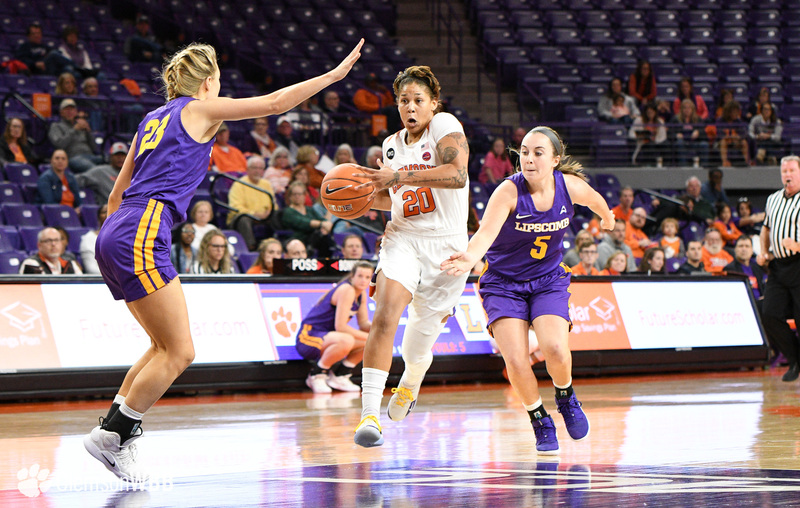 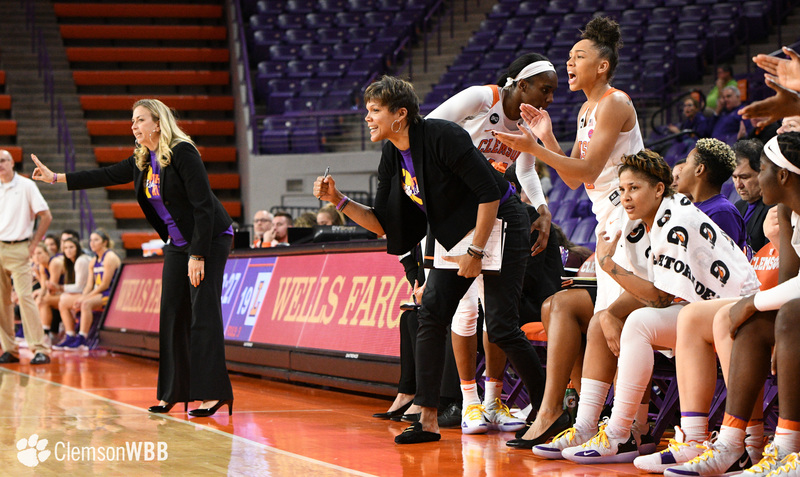 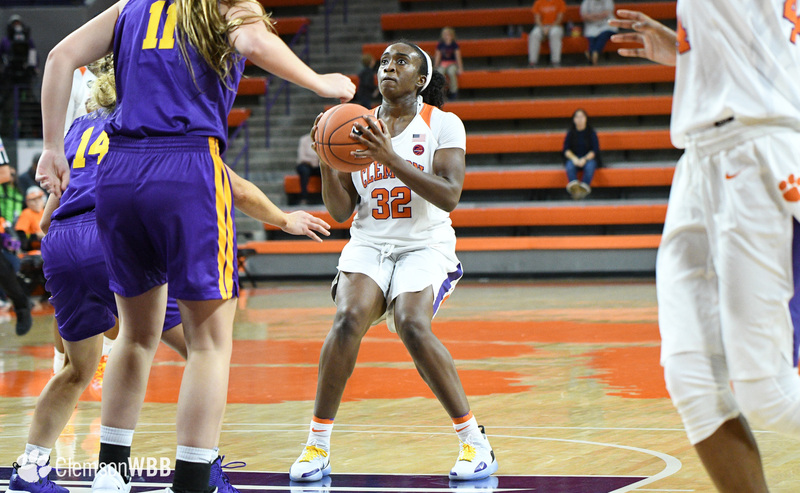 Veteran point guard Danielle Edwards sank a pair of three-pointers for Clemson in the first half, as Clemson controlled the pace of the game on the offensive end en route to garnering a sizable lead. 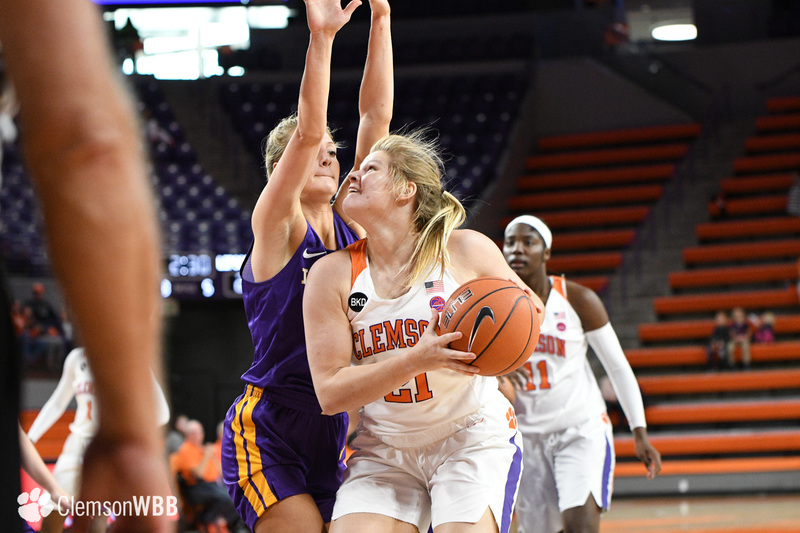 Thornton put an exclamation mark on Clemson’s impressive opening half with an emphatic put-back layup while fighting through contact during the second quarter. 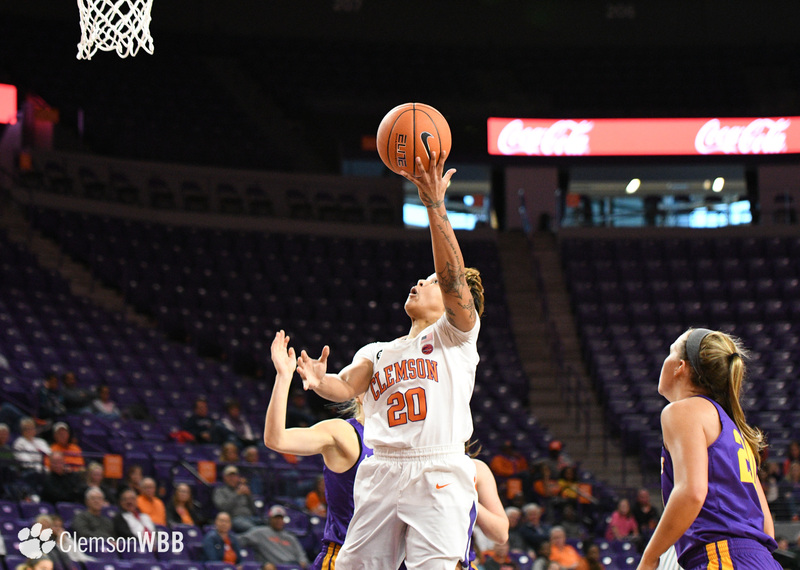 Thornton made the ensuing and-one free throw, and Clemson took a 38-12 lead into the locker room at the half. 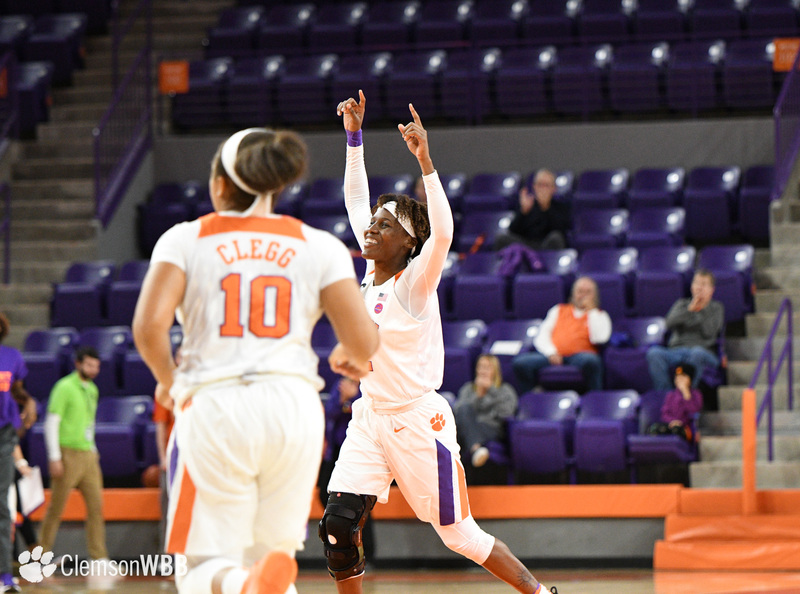 Clemson increased its offensive efficiency in the second half, shooting 12-of-23 from the field with a pair of 3-pointers off the hands of Clegg. 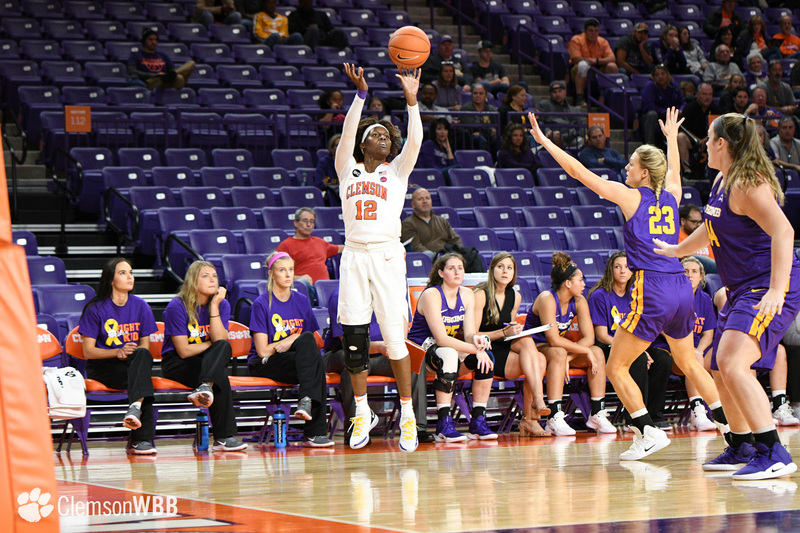 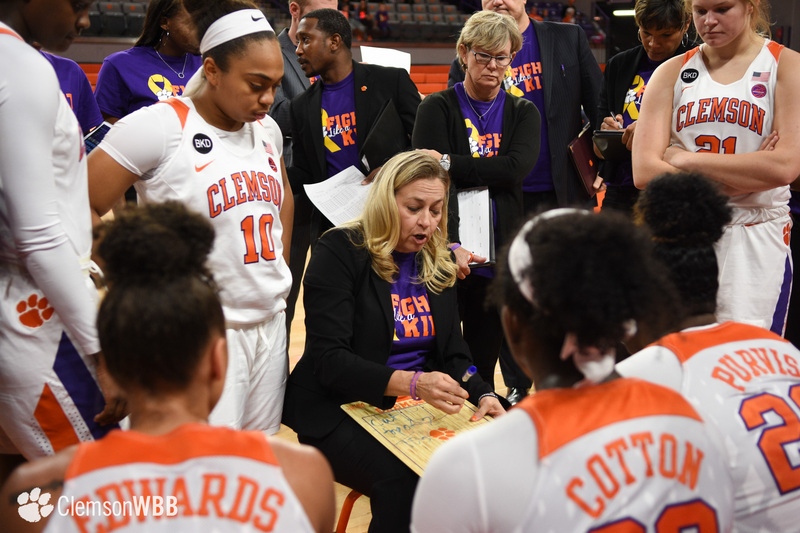 As the Tigers pulled away, the Clemson bench continued to produce with buckets from Taylor Hosendove and Chyna Cotton. 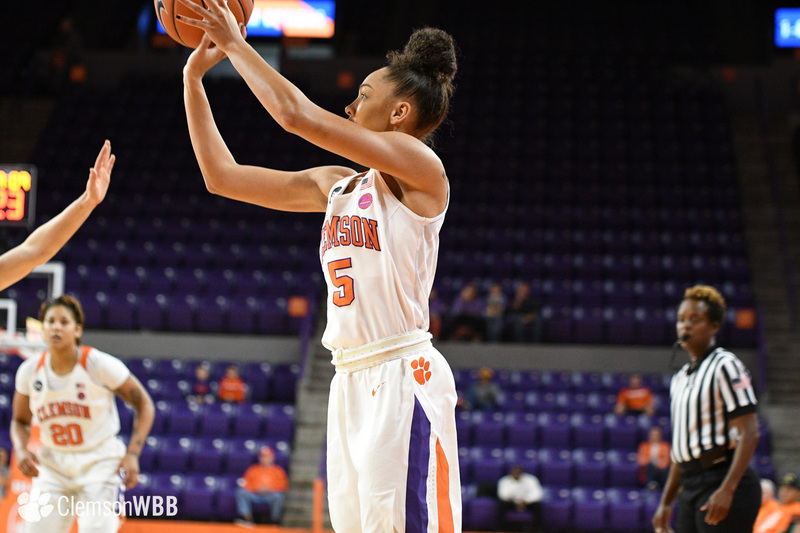 Freshman Skylar Blackstock closed out the scoring for the Tigers, pouring in a contested jumper with 2:26 left to play in the game. 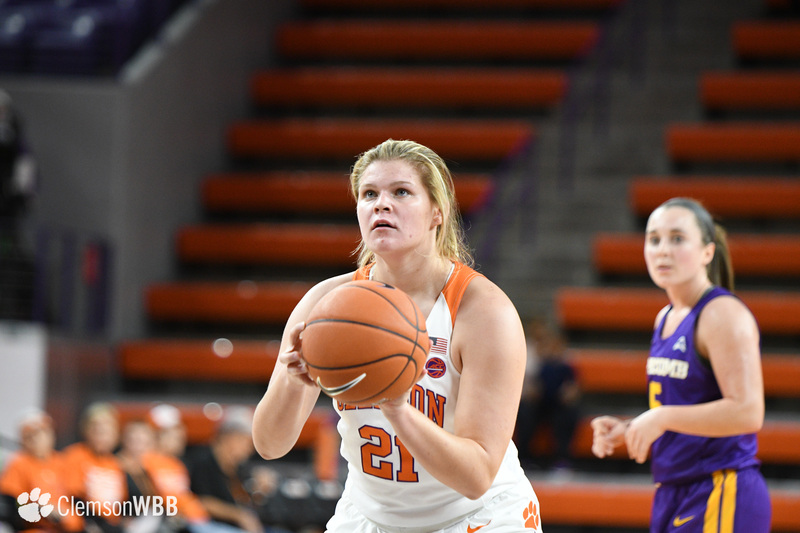 Anna Hammaker paced the Bisons offense, scoring seven points on 3-of-15 shooting. 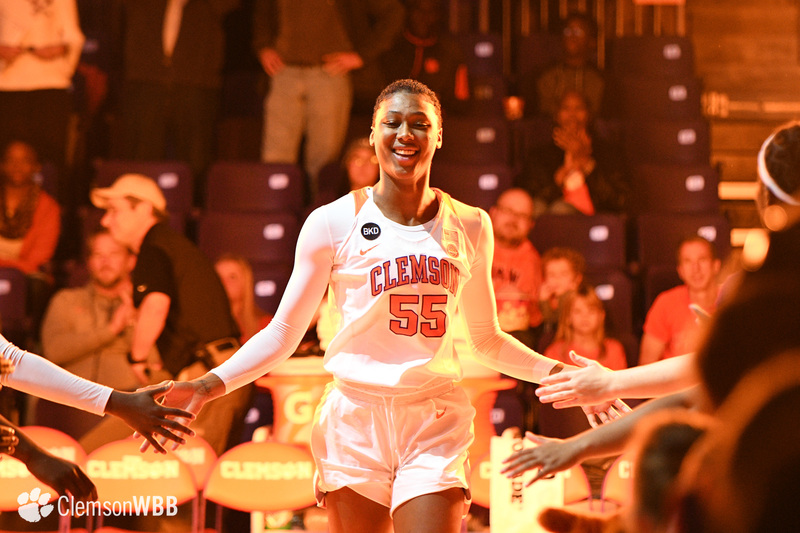 Sunday’s matchup at Littlejohn Coliseum saw military veterans in attendance honored as part of the Veterans Day festivities. 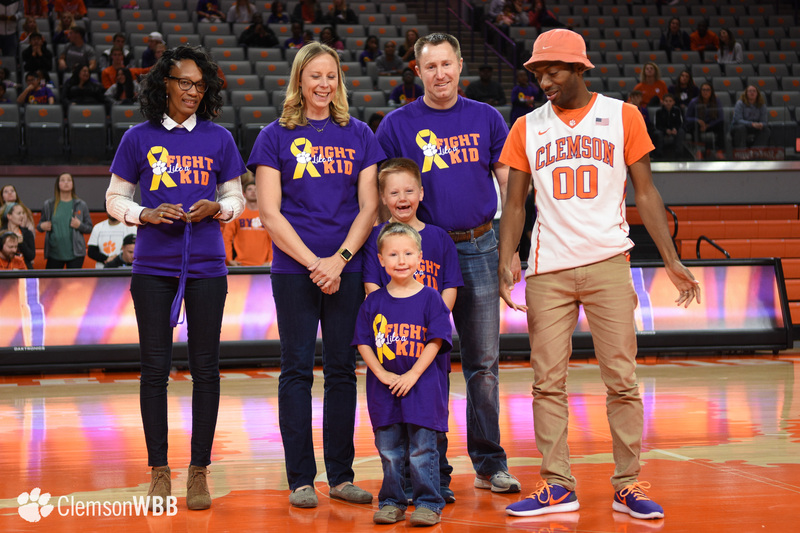 Furthermore, for the fourth consecutive year, the Tigers brought attention to the fight against pediatric cancer by honoring several brave little boys and girls at the intermission. 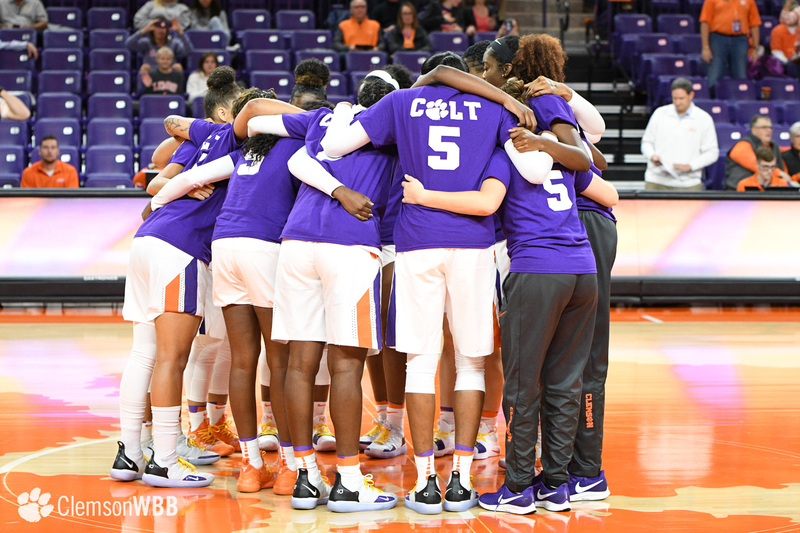 Clemson is set for its first road test of the season on Thursday, Nov. 15, in a battle with in-state rival South Carolina. 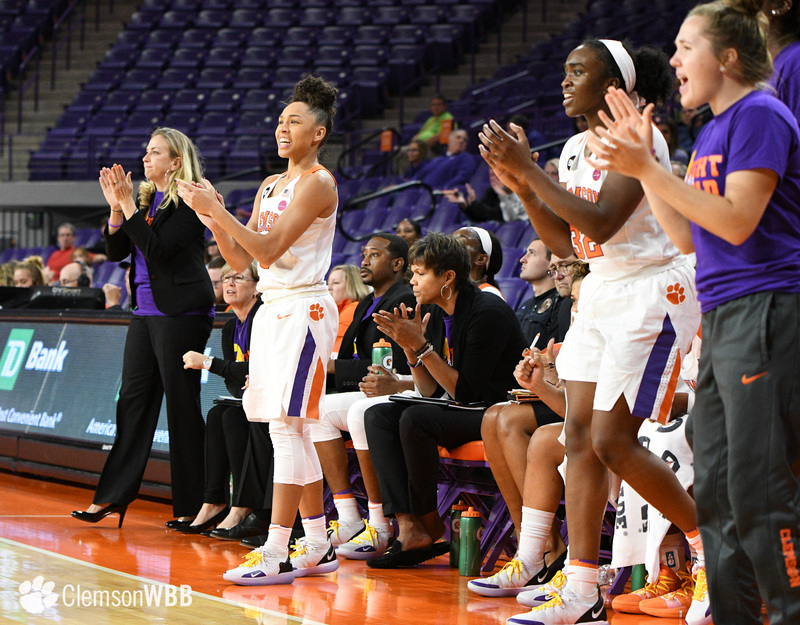 Tipoff is slated for 6:30 p.m. at Colonial Life Arena in Columbia, S.C.